-Do I have your water glass? -Am I eating your bread? Rhyan knew most of the answers (she’s my intern!). She is also resourceful, so she unobtrusively googled “place settings” on her SmartPhone under the table to get any information she didn’t know. Usually, I discourage texting or cell-phone use in restaurants. But reading a place setting correctly during a business meal is important -- you want to spend your time connecting with the other diners, not worrying that you may be eating your neighbor’s bread. 1. Use one of the following memory tricks. 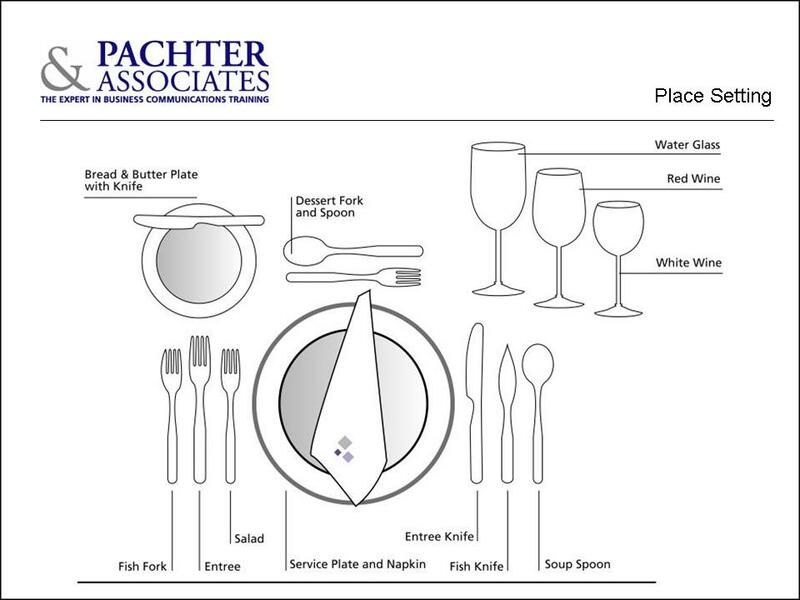 They will help you remember the correct placement of the plates, glasses and utensils. -Think of the “BMW” (Bread, Meal, Water). It will remind you that your bread-and-butter plate is on the left, and water glass is on the right. -Remember your “left” and “right.” Food is placed to the left of the dinner plate. The words food and left each have four letters; if the table is set properly, your bread or salad or any other food dish, will be placed to the left of your dinner plate. Similarly, drinks are placed to the right of the dinner plate, and the words glass and right contain five letters. Any glass or drink will be placed to the right of the dinner plate. 2. Learn the utensils. Don’t be like Oscar Wilde who said: “The world was my oyster, but I used the wrong fork.” The largest fork is generally the entrée fork. The salad fork is smaller. The largest spoon is usually the soup spoon. 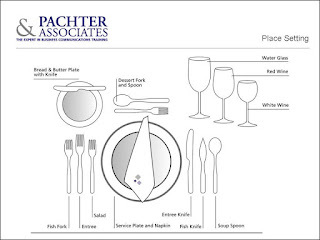 If you are having a fish course, you may see the fish knife and fork as part of the place setting. The utensils above the plate are the dessert fork and spoon. 3. As a general rule, navigate your plate setting from the outside in. Each course should have its own utensils. 4. Don’t panic if you use the wrong utensil. When the course arrives for which you need that utensil, just ask the waiter for another. If a dinner companion uses your utensil, quietly ask the server for another. 5. Do what your host does. If you don’t know what to do, copy what your host is doing. You may not be right, but you are not wrong. Some of my other blogs have also discussed dining, including: How To Treat The Wait Staff With Respect. Additional information on dining can be found in my book, When The Little Things Count...And They Always Count. If you would like additional information about business-dining seminars or coaching, contact Joyce Hoff at joyce@pachter.com or 856.751.6141. Barbara, thank you for this interesting article. I have read you book, "When The Little Things Count..." and plan to pick up your other books, especially the one titled, "Greet! Eat! Tweet! -- what a great title! I would add, though, that my interns as well as my daughter have resorted to using their devices for the same purpose and I have stressed that it is far better to be missing a piece of information than to use their devices at the table, and that the only reason to use their devices at the table is to call for an ambulance for someone; otherwise, they must excuse themselves and step away from the table and out of sight of the diners to make a call. Sorry, but googling, taking calls or texting at the dining table these days is akin to lighting up a cigar or cigarette at the table, and is such a taboo that I emphatically discourage it. Thanks for your comments. I agree about not using devices at the table and will often stress that point in my writings. But there are always exceptions, and I would like to consider my example as an exception. Spoon, Knife, Glass, Right are five letters....this has worked very well for my students. Great exercises. Thanks for sharing.